Acoustic chamber jazz ensemble, performing arranged and original compositions extending into classical and experimental genres. 6/24/2013 KPFA radio interview, and find out how on earth he started composing at six, and how Resonance evolved! Resonance Jazz Ensemble performs inspired originals by bandleader Steve McQuarry, as well as deliciously creative arrangements of jazz standards, pop tunes and classical favorites with woodwinds, strings and a rhythm section that includes piano, double-bass and drums. Resonance is a unique collaboration of jazz and classical musicians, and is the only jazz ensemble in Northern California with this unusual instrumentation. 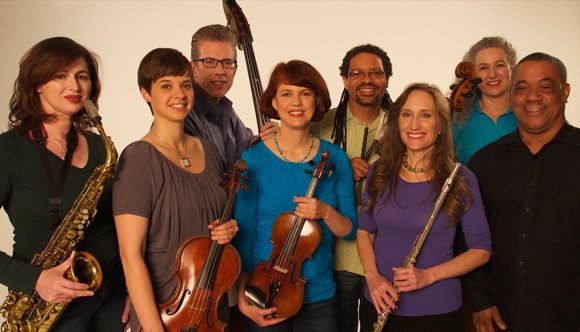 Resonance captivates audiences with its singular, lush sound punctuated by driving rhythms and improvised solos. Resonance Jazz brings together artists of richly diverse musical backgrounds. Members of the octet have performed with many legendary artists, such as Dizzy Gillespie, Louie Bellson, Clare Fischer, Dave Anderson Quartet, Terrence Brewer, Joe Lovano, Jethro Tull, Oakland Jazz Choir, Mingus Amungus, Gloria Estefan, as well as the Marin and Berkeley Symphonies, Woodminster Theatre Orchestra, and the California Pops Orchestra. Download EPK 6.8MB images, reviews, album info, etc.